I have breakouts once a month (that girl point of the month) in my t-zone and even though I’m lucky enough to not have them every day, that week once a month where I do break out is always the worst week. My skin hurts, looks horrendous with and without make up and just nothing can fix it. It’s just such a girlie hormonal thing, nothing can sort it out. I usually find that if I apply foundation over the top of spots, in particular my Mac Studio Fix foundation, that they make my skin look worse. They almost make your spots double in size and make them stand out more. Concealer is the same, does it really conceal spots? Redness, yes, but I’m yet to find a concealer which doesn’t just make my spots more apparent. When I put this on my face, I was shocked. This is hands down, the only thing that I have come across where 1. No concealer is required. 2. It doesn’t make my skin look worse. 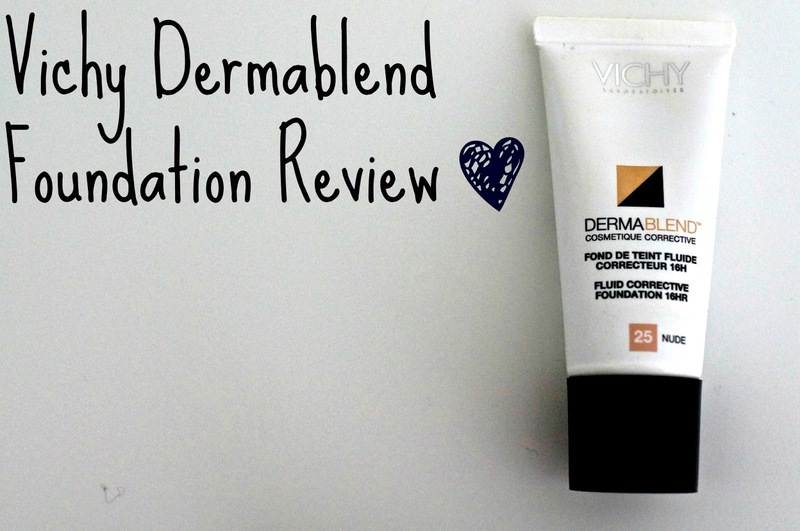 Vichy's Dermablend is actually like a miracle foundation, hence why I needed to give this such a rave review. I don’t understand how it does it, but trust me, it does. I keep making the mistake of putting far too much on my fingers, because loads does tend to come out, so do be careful. I tend to put a tiny bit on my chin (the problem area) and then because it is so thick I just blend that with my RealTechniques foundation brush around the rest of the face, a tiny bit on the chin when blended, covers the whole face. Some foundations are very thick, and cakey looking. This is surprisingly very natural looking when blended, it doesn’t look like a mask, or cakey and doesn’t give you those nasty lines down the side of your face as long as you blend well. With careful blending, this looks radiant, moisturizing and just great. It almost looks too shiny so make sure you add some powder, you don't want that sweaty look. I have been running around London with it on this week and put it on my face at about 10am, it is still on my face at 6pm. This could be the foundation or it could be the ThisWorks primer, which I’ve been wearing underneath it. I don’t want this to run out. Ever. This can go very matte when its dry, so I tend to mix some of my Becca shimmering skin perfector in with it, or apply this on my cheeks before I apply the foundation. It just makes my skin glow a bit more and look more awake. As you can see, it does look thick, but it does feel lightweight and look natural on the skin. I really try to only apply it thickly to any areas which I actually want to cover up and then just lightly blend the rest of the face with it. After researching it, I found out that it is a corrective foundation, designed to give total coverage. It’s designed to give up to 12 hours of long lasting and flawless wear whilst providing an even skin tone – which would explain why I found it made me look so flawless, it’s just doing its job! Another thing I found out, (exciting) is that it includes Vichy thermal spa water, which is renowned for its soothing and fortifying properties. This leaves your skin moisturised and comfortable all day. I can vouch for this. So basically, it's like a treatment foundation which treats your problems. You can see me wearing it on this photo. It is a horrible photo but I think you can see how radiant it makes my skin look. I love how natural this is, it hides my skin concerns but still allows my natural skin to shine through. Bring on the illuminated look this Summer. I feel like this foundation gives such a Kim Kardashian make up look, it gives you that flawless yet natural and glowing finish. I feel so radiant and moisturized with this, my favourite fact? You only need to use a teeny weeny bit. This costs £15.50 which is quite expensive as the bottle isn’t that big, but, you only need to use it sparingly. I love it and couldn’t recommend it more. The only other thing I don't like about it is the smell, it is VERY 'foundationy'. Apart from that, I love the look of it. My major tip is, only use a tiny bit and add some highlighter or moisturiser to it. Tadaa! Have you ever tried Vichy Dermablend foundation or anything similar? P.S, you can get it in Boots now which is exciting, French skincare has finally flown to the UK. What do you think of this? Do you have any tips for bad skin? This looks so nice on you! I'd read about it before and when reading full coverage it made me think it may look cakey or too much but after seeing it on your skin I want to try it! I am exactly like you and only get spots at the girly time of the month and I absolutely hate it. I too have been using MAC Studio Fix but I will definitely be giving this a try! I have been using this for a while and absolutely love it. I don't apply it all over my face, only to spots which need extra coverage( I usually apply BB/CC cream). Find the coverage is just perfect and don't make my face cakey at all. I keep on pondering this, but I'm always wary of changing foundations as they can break me out. This review has almost pushed me over the edge though, I might have to give it a go! I've been thinking about buying this since Tanya Burr used it in one of her videos, now when I get back from holiday I will have to try it. Such a good review, I have the same problem with my skin sometimes and am looking for that 'miracle foundation'! Thank you for this!! Em great review :) This foundation looks so good!! I did not know they have foundation, thanks for the review! I use from Vichy some cleaning lotion for skin issues and I love it. I also had some cream from them and was very happy. I think they're quite good when it comes to skin issues. I need a new foundation soon, so this is very helpful! I have really wanted to try this foundation for a while now, but never got round to buying it as i love my NARS sheer glow too much! Really good review! Need to try this stuff! I have been dying to try that becca forr ever! This looks great!! I find that foundation and concealer always makes spots stand out more, so this foundation has got serious appeal!! Which Is The Best BB Cream?